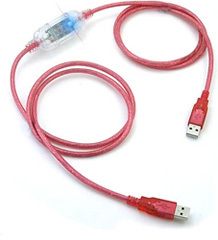 USB Data Link Transfer Cable | OhGizmo! By Andrew Liszewski on 04/17/06 • Leave a comment! For the occasional times when you need to transfer a load of files between two PCs and network cables or wireless networks aren’t available it might be handy to have this USB data transfer cable on hand. It’s as easy to use as plugging each end of the cable into the PCs you wish to move files between. It will automatically display the drive contents of each computer allowing the user to simply drag-and-drop whichever files or folders they need to transfer. It’s also USB 2.0 compliant (what isn’t these days?) and will copy at speeds up to 25Mb/sec. The USB Data Link Transfer Cable is available now from ThinkGeek for $19.99.